Chana chat on your dinner table can be a tangy appetiser or, best, an evening snack. 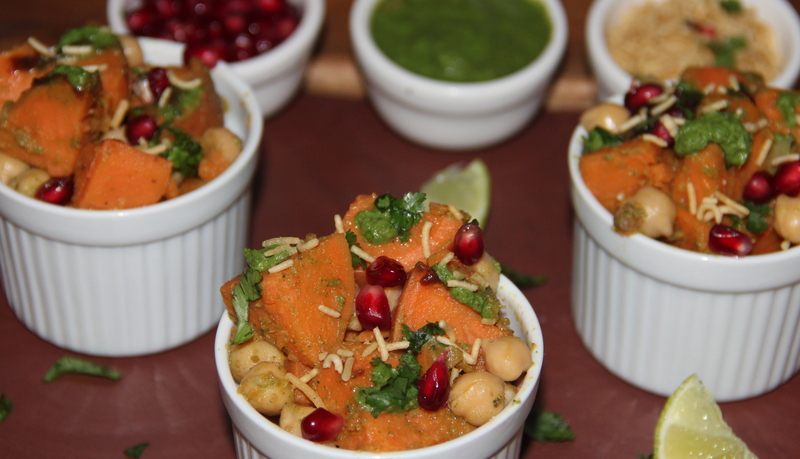 In any case, this chaat recipe is a perfect alternative to eating from the street side. So here is a recipe that can be served as a side dish, a starter, or simply for snack time. I love this chat because it is SO easy and so fresh! I start with steamed sweet potatoes which are pretty much my all time favorite food. Chickpeas adds protein to the salad. I added a splash of pomegranate dressing to bring out the pomegranate flavour. The dressing is nice and light and gives the salad a little boost of flavor! Sweet potatoes potassium content is also helpful for your heart, as it lowers blood pressure by maintaining fluid balance. They have a low glycemic index (which means they release sugar slowly into the bloodstream). If using dried chickpeas- rinse and soak overnight for atleast 6-8hours. Pressure cook for 4-5 whistles with enough water. Drain and set aside. Steam cook sweet potatoes peel, dice and set aside. In a mixing bowl combine sweet potato, chickpeas, onion, and pomegranate, black salt, chat masala lemon juice, mint chutney, tamarind chutney mix well until well combined. Divide the chat among serving bowl/plate- garnish with chopped coriander, sev and serve immediately. Can substitute mint chutney with fresh mint. Spices and proportion of chutneys can be personalised as per the taste. If using canned chickpeas rinse and wash thoroughly to remove the sodium content in it. Posted on March 6, 2015, in Indian, Salad/Wraps. Bookmark the permalink. 16 Comments. I’ve never had anything like this, but I love all the ingredients–it looks great! This looks delicious! Wish I had it now!